Little by little, Cosey moves, adds and deletes Post-Its and the notes become to get some organisation, they become a coherent whole. On the photo: Cosey at work. See the Post-It notes at the top left of the picture. And Cosey starts collecting the right documentation. The time spent has given him opportunity to let the story mature in his head and he begins to write a scenario that can be presented to his publisher. Then starts the work that Hergé has called ‘ a surgeon’s work’: the partitioning of the story into pages, into separate scenes. ‘It is a kind of lay-out or ‘mise-en-scène’, but I won’t go any further than the sequence in question.’ Cosey first completes the whole sequence until the final drawings, before he continues to the next scene. So, Cosey has a scenario indicating approximately which scenes have to be in which page. Then, he starts at page 1, and starts to elaborate the first sequence until it is completely finished, before attacking the next sequence. 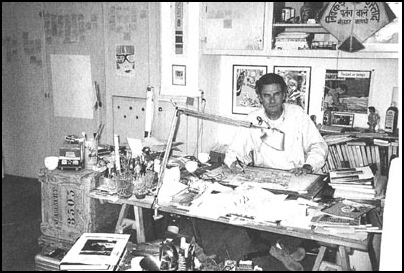 Cosey makes his drawing sequence by sequence, page by page. He makes a composition of the pages (1.5 times as big as the album), and then draws each image on a separate sheet of tracing paper. 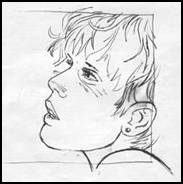 In general, he makes his drawings as mirror images of the final drawing that will appear in the album. 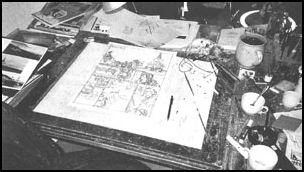 The separate images are brought to the final page by tracing them on a illuminated table. Finally the page is traced with Chinese ink. 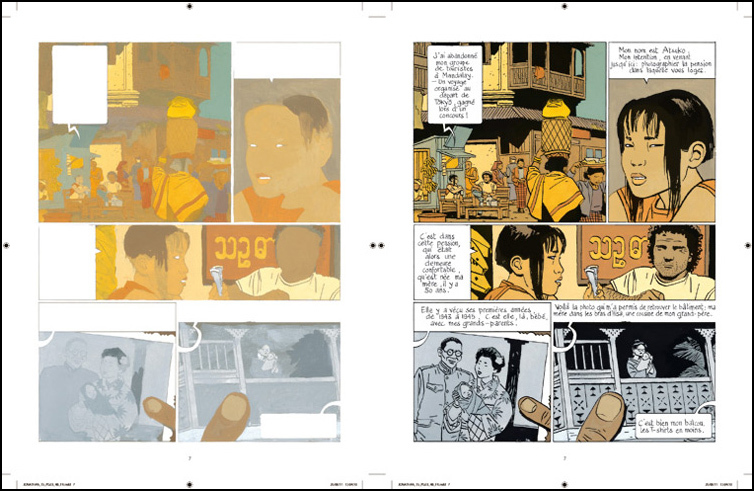 Page 6 of Atsuko: on the left the ‘bleu de coloriage’, on the right the complete page. 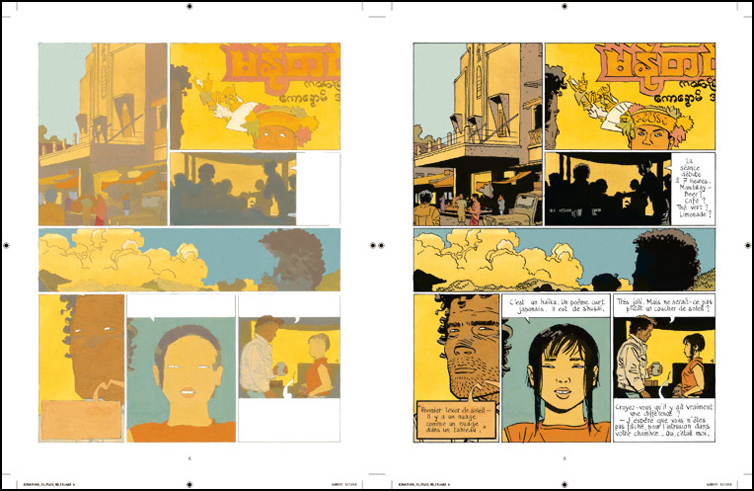 Page 7 of Atsuko: on the left the ‘bleu de coloriage’, on the right the complete page.